I’ve had my two Nomads for a while now, and as I prepare to move on to bigger and better things, I feel I can do a great service to the community by giving a accurate and heartfelt review of the machines. I will keep it simple: buy one. buy two. I will have my heavily used machines for sale in the coming weeks, including hundreds of dollars in spare parts and tooling. I have been making brass foil stamping dies for over a year now, and these little machine have held up surprisingly well. I’m not gentle. I am merciless in my pursuit of productivity. I have driven these machine past all sane expectations. They have never failed me, never left me stranded. Yes, I’ve had to replace a couple spindles, that is until I found the correct bearings and a nice little arbor press. I can rebuild a spindle for $16. My older unit needed a new circuit board at one point, but that was a known issue. Since the upgrade it has performed flawlessly. When I had issues, Carbide3D was extremely sympathetic, and very quickly solved the problems. I couldn’t ask for better customer service. 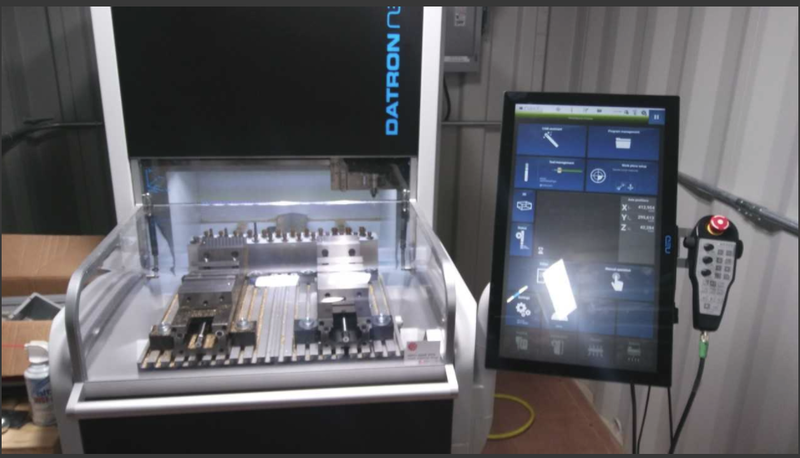 DATRON neo is a compact high-speed milling machine with a user-friendly touch-screen control. Ideal for prototyping and short-run production. it costs about $120,000… but it can run my dies in minutes instead of hours. If I tried to keep up with this machine, I would have to have at least 15 or 20 nomads. I love the community, I love the people at Carbide3D. If anyone has questions, I will help if I can. Just send me a message, and we can take care of the problem through email. I don’t have a need for it. I don’t have a place for it to live. I don’t have the power to feed it. But I never knew I wanted something so bad until I saw that. Good luck and godspeed in your new adventure! I like that way of being yours, if you go with a Neo you go very well, surely you need it and I see it excellent, I hope to have a machine with the image of Neo and so I update my S3 with that same concept. Awesome! Can you do a show and tell with part numbers for your spindle repairs? Yes! I’m interested as well about how to repair the spindle! So after loosing my head and buying a 2.2kw spindle I thought I’d setup a thread as a write up for the install. I took delivery today but thats about it. I thought I’d do a quick video of what it looks like, it’s a MONSTER! 5kg + a 1kg mount… Heres first impressions. Breant to me is a good election . Find this topic in the forum . I am working on pictures and step by step instructions. Give me a little time, as I’m very busy at work since I became the Maintenance Manager, as well as the guy that makes all the dies for the company. Guess what arrived… no spoilers! In the next few days, I’ll have the HVAC system installed. Got to keep the NEO between 68 and 72 degrees. Got my desk moved in. The technician shows up today to install the machine and get it running for the first time. he will be hanging around for a couple days, for training. You get the award for best “Mega Mega Mega” enclosure ever! Definitely not screwin’ around with this one!!! Here’s my baby, all warmed up and ready to run!